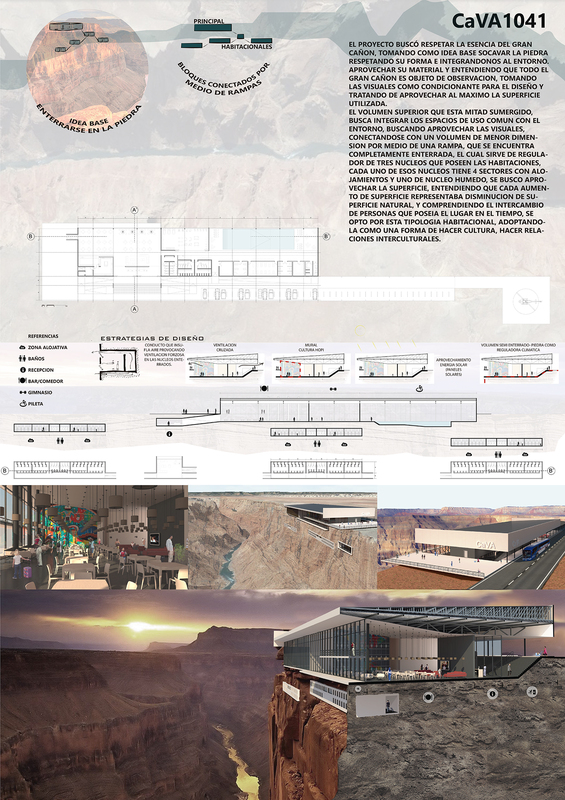 EL PROYECTO BUSCÓ RESPETAR LA ESENCIA DEL GRAN CAÑON, TOMANDO COMO IDEA BASE SOCAVAR LA PIEDRA RESPETANDO SU FORMA E INTEGRANDONOS AL ENTORNO. APROVECHAR SU MATERIAL Y ENTENDIENDO QUE TODO EL GRAN CAÑON ES OBJETO DE OBSERVACION, TOMANDO LAS VISUALES COMO CONDICIONANTE PARA EL DISEÑO Y TRATANDO DE APROVECHAR AL MAXIMO LA SUPERFICIE UTILIZADA. CONECTANDOSE CON UN VOLUMEN DE MENOR DIMENSION POR MEDIO DE UNA RAMPA, QUE SE ENCUENTRA COMPLETAMENTE ENTERRADA, EL CUAL SIRVE DE REGULADOR DE TRES NUCLEOS QUE POSEEN LAS HABITACIONES, CADA UNO DE ESOS NUCLEOS TIENE 4 SECTORES CON ALOJAMIENTOS Y UNO DE NUCLEO HUMEDO, SE BUSCO APROVECHAR LA SUPERFICIE, ENTENDIENDO QUE CADA AUMENTO DE SUPERFICIE REPRESENTABA DISMINUCION DE SUPERFICIE NATURAL, Y COMPRENDIENDO EL INTERCAMBIO DE PERSONAS QUE POSEIA EL LUGAR EN EL TIEMPO, SE OPTO POR ESTA TIPOLOGIA HABITACIONAL, ADOPTANDOLA COMO UNA FORMA DE HACER CULTURA, HACER RELACIONES INTERCULTURALES.